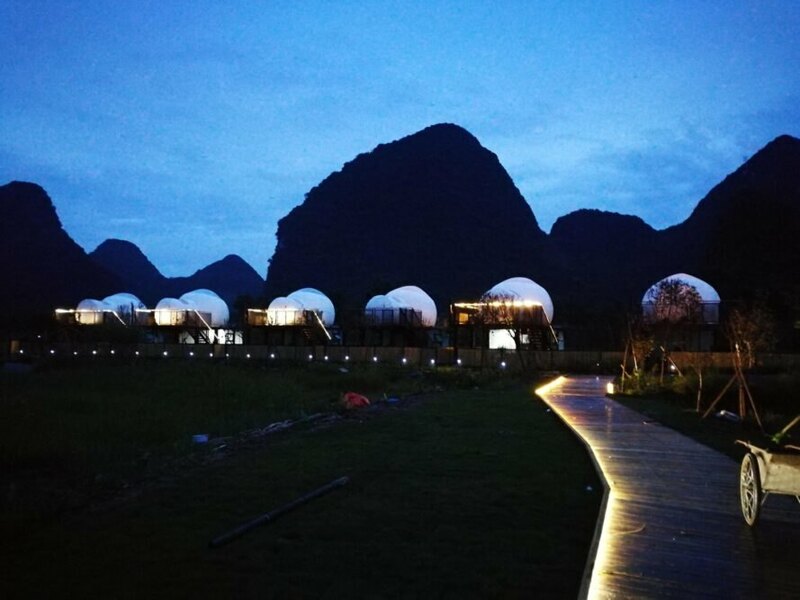 For those who need a little respite from the hustle and bustle of life and who may find themselves in the Guangxi region of China, there is an entire glamping site comprised of transparent bubble domes. 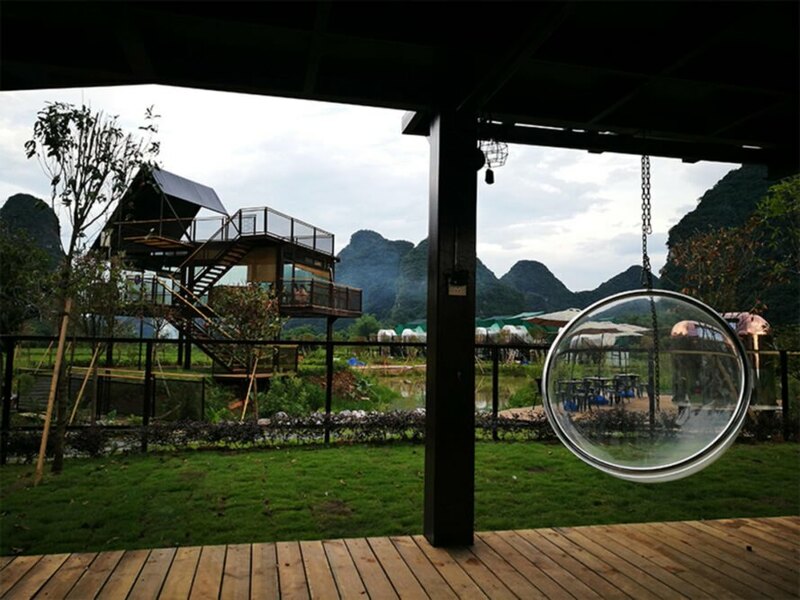 Created by designer ChengWei Chiang of PL Interior Design Studio, the Wow Bubbles are made of special transparent PVC material to let visitors truly immerse themselves in the idyllic landscape that surrounds the site. Located in the mountainous area of southern China bordering Vietnam, Guangxi is right on the coast and known as a nature-lover’s paradise. Full of lush green forests, winding rivers and towering karst formations, the area is a popular tourist spot for both adventurers and those who just want to commune with nature. Now, visitors to the picturesque area can go one step further by staying in the Wow Bubbles lodgings. Made out of special PVC material, the transparent bubble huts are inflated with air. Waterproof and resistant to wind, they were also designed to withstand the severe humidity that is common in this coastal area. The bubble domes are strategically orientated to provide stunning, unobstructed views of the mountains and forest that surround the site. A wooden walkway on the edge of a small lake leads to the individual domes, which are lifted off the landscape on wooden platforms. Once inside, the interior design is quite contemporary. With a spacious living area, a large bedroom and bath, the huts provide all of the amenities of home. 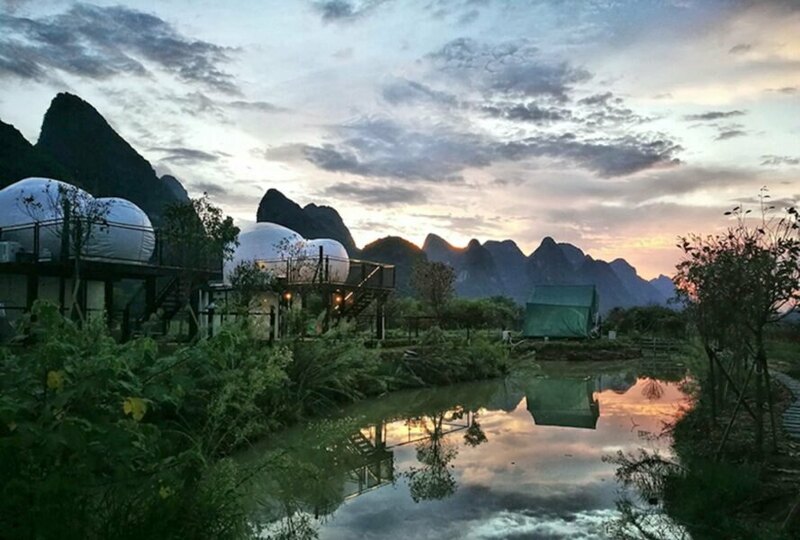 The Wow Bubbles are located in the mountainous area of Guangxi in southern China. The bubbles are made out of a special PVC material. 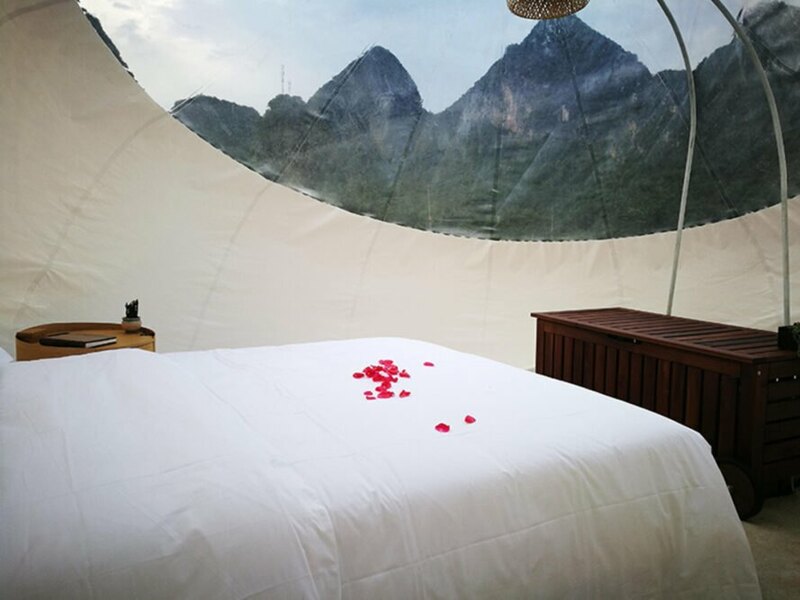 The bubble domes are strategically orientated to make the most out of the stunning views. The domes come with all of the amenities of a regular hotel suite. There is a beautiful white bathtub that offers a nice warm soak while taking in the views. The interior design is modern and fresh. 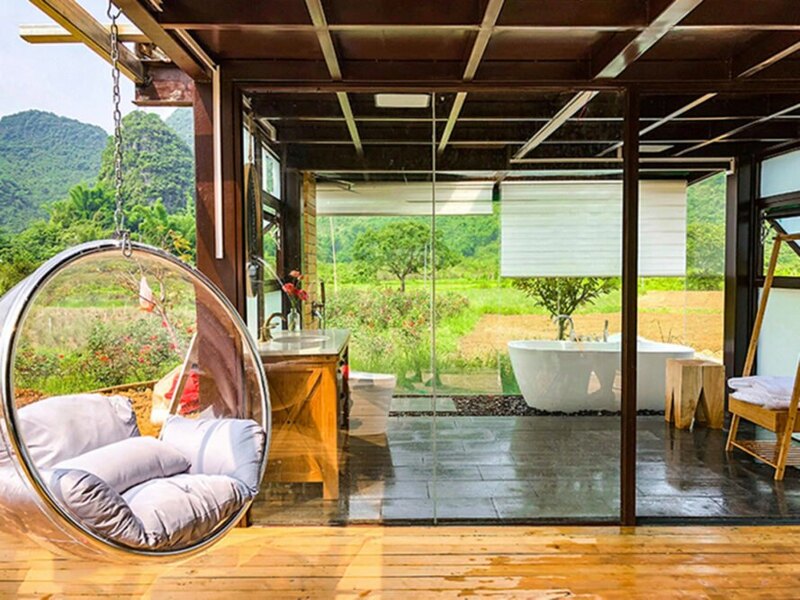 The bathroom looks out over the natural landscape. There is also an on-site terrace and dining area. The on-site terrace provides an area to socialize or just enjoy more of the views. The bubbles are reached by a wooden platform built over a small pond.